Three Basic Elements inside IC (Learn VHDL with Naresh Singh Dobal series). 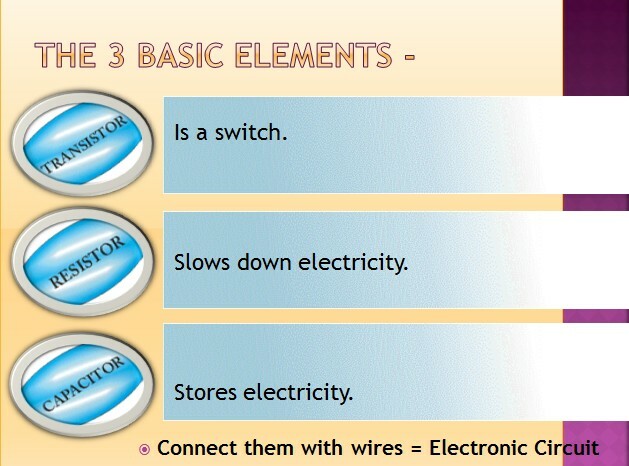 There are three basic elements in a computer chip, First one is called a transistor and this is the switch just like a light switch, that turn on or off, and flows and block the electricity, this is the three terminal device. Next one is resistor, and resistor slows down the electricity, when electricity passes threw the resistor then it resist the flow of electricity, it’s symbol is like a zigzag line, and this is a two terminal device, and this is very important in electronics, Resistors comes in different values and different sizes. If you see them in real then you can see some band of colors these band actually tells the value of resistance, don’t worry about that I will tell you that how you can identify the value of resistors using color bands. The third most important part of an integrated circuit or computer chip is capacitor, and a capacitor stores the electricity, These capacitors makes up of different materials and different sizes, this is basically a two terminal component. So now if you connect these all components a resistor, transistor and capacitors with the help of wires then you have a some type of electronic circuit. hai sir this is a student from AITS AP; PLZ post your programs with logic diagrams.